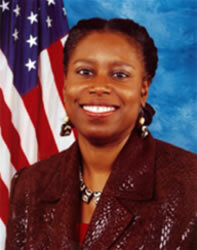 Former Congresswoman and 2008 Green Party Presidential Nominee will participate in an International Peace Conference scheduled to take place in Munich, Germany on February 6 – 7, 2010 while the North Atlantic Treaty Organization (NATO) meets in the same city to plan war. McKinney, a long-time proponent of abolishing NATO, is scheduled to speak on February 6 at a rally to protest the NATO “security” conference. After the rally, McKinney will participate in the International Peace Conference whose schedule and call to demonstrate against NATO war policies are included below. Included in McKinney’s program is a meeting with the Munich American Peace Committee (MAPC – www.mapc-web.de) which will present to McKinney its third annual award, “Peace through Conscience,” during the ceremonies of the Munich Peace Conference on the evening of February 6, 2010. Take action against NATO war policies! The members of governments of NATO countries, high-ranking officers, military strategists, and arms lobbyists who meet in Munich every year at the so-called Security Conference have one thing in common: they share the responsibility for the illegal wars waged against Yugoslavia, Iraq, and Afghanistan, with many thousands of deaths, for growing terror, torture, and sufferings of refugees. NATO, and with it Germany, have declared the whole world their area of operation. At the same time, the militarization of the EU is being pushed intensively. The EU is arming so as to be able to wage wars on its own. The new EU treaty specifies that the member states undertake to upgrade their military capabilities, and that a European agency for promoting armament will be created. In violation of our Constitution, and against the will of the majority of the people, the Bundeswehr is taking part in the war in Afghanistan. That war is about geostrategic interests that are supposed to be implemented militarily with the help of NATO: access to markets and raw materials, the hegemony of the rich and powerful NATO states, and their military presence in the region. For the population of Afghanistan, this means terroristic air raids, expulsion, destruction, torture, and death by the thousands. Now that it is becoming more and more obvious, even to the politicians responsible, that they cannot achieve their goals by military means alone, NATO is trying to change its strategy; and this is also reflected in the Munich Security Conference. The concept of civilian-military cooperation (CMC) and the instrumentalization of nongovernmental organizations are intended to allow the old NATO goals to be pursued more effectively. The inclusion of commercial firms and energy specialists, as well as topics such as disarmament, resource security, piracy, terrorism, and “human security” in future ‘Security Conferences’ are part of this. According to the head of the Security Conference, there is a debate about whether “we should continue to use basically NATO to implement national-security interests, or rather the EU, or both structures with their respective military capabilities”. The people of Afghanistan are currently experiencing the results of these “military capabilities”. This is why the 2010 ‘Security Conference’ is another war conference, which we will oppose with our varied and creative protest. End the NATO war against Afghanistan! Get the Bundeswehr out now! It is not an immediate withdrawal of all the foreign troops that would make Afghanistan collapse in chaos; on the contrary, it is NATO’s terrorist war and the continuing occupation which are causing the lethal chaos in that country. An immediate withdrawal of the Bundeswehr and all the other foreign troops and mercenaries will not solve Afghanistan’s problems; but this withdrawal is an essential precondition for self-determined and peaceful development and the reconstruction of the country. No to German participation in any war! Get out of NATO – Get out of all EU military structures – Abolish the Bundeswehr! The billions spent on armaments and war must be redirected to social needs! At present, more than two-thirds of the worldwide military expenditures of about 1.4 trillion dollars a year are spent by the NATO countries. At the same time, world poverty continues to increase. The number of people going hungry grew to more than a billion last year. The policies of the rich and powerful nations – the USA and the EU countries in particular – are also largely responsible for the plundering of natural resources, the increasing destruction of the environment, and the climate catastrophe. These policies serve the profit interests of the big banks and corporations, and the arms manufacturers, above all. While billions are being spent here in Germany on new weapon systems and the global military interventions of the Bundeswehr, the Federal government is demolishing our social-welfare systems. The burden on the unemployed and the employed, young people, pensioners, and welfare recipients is growing constantly. The rich get richer, while the poor get poorer. War, hunger, torture, environmental destruction, and no hope for the future are the causes of the misery of millions of refugees. So we oppose the sealing off of the borders of ‘Fortress Europe’, Frontex military missions against refugees, any kind of exclusion of immigrants, discriminatory laws for foreigners, the virtual abolition of the right of asylum, deportations, and every form of racism. – Combat the causes of their flight, not the refugees! – No camps – No barbed wire – No deportation! Munich must not become a police fortress! With our demonstration against the so-called ‘Security Conference’, we are also standing up for the unrestricted right to the freedoms of assembly, opinion, and demonstration. Under the pretext of a growing danger of terrorism, fundamental democratic rights and our Constitution are being undermined systematically. The unconstitutional mixing of the responsibilities of the police and state security bodies (Verfassungsschutz), online searches of private computers, the required storage of data on everybody’s telecommunications, biometric registration of all citizens, preventive detention, and the restrictions on the right to demonstrate mark the way to an authoritarian state with constant surveillance of the people. The Bundeswehr is already being used to support the police at home, in violation of the Constitution. Armament and war, demolition of the welfare state and growing poverty require joint action by all emancipatory movements. We oppose the capitalist system that will stop at nothing for the sake of profit, and advocate disarmament and a world without exploitation, war, and occupation. Let us show the self-appointed world rulers and armchair warriors: You are not welcome here inMunich or anywhere else! We will resist your policies of neoliberalism, re-armament, and war. Let us demonstrate jointly and creatively against the NATO war meeting on Friday and Saturday, 5-6 February 2010, in Munich. No to racism and war!